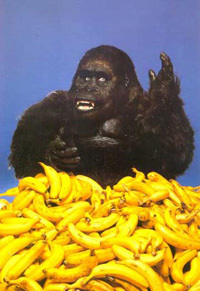 "So Long and Thanks for all the Bananas!" Here's a cool pic I found done by the artist Eric Lofgren. I'd love to see him do some work for a Mutant Future supplement! My wife surprised me with some new dice yesterday. She picked up some Rory's Story Cubes! 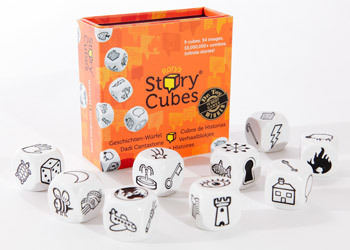 These are really cool and perfect to help a DM with some inspiration for a session. She said they were $6 at the corner Walgreens! There are two other sets that I will definately be picking up! 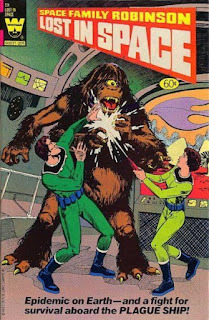 Dreams in the Lich House has done an excellent Simian Post for your Old School Gaming that I wish I had thought of! Hope Everyone is having a Great Simian Saturday! Shocker of shocker Rifts : Lemuria is out! I think I recall this being first advertised...what? Ten years ago?! Anyways if your interested you can download the Sneak Preview of it here. I have to admit for some reason I'm tempted to pick it up... I'm not sure what it is, but I still get drawn back to Rifts. We played the hell out of it in the 90's. I ran several Campaigns of Rifts, Heroes Unlimited, TMNT, Ninjas & Superspies! Sometimes all in the same Campaign. The mechanics were and are nuts, but back then we didn't seem to notice, maybe that was because it was the 90's? I dunno. Now I pick up the books, talk to the guys about playing, we get excited, start to make up characters, then a few hours into character generation our eyes glaze over and we do something else... but I still get drawn to the books! It's crazy I know. I've sat down to convert Rifts to other systems quite a few times over the years, but that quickly turns into a chore and eventually my Gamer ADD kicks in and I move on to something else. 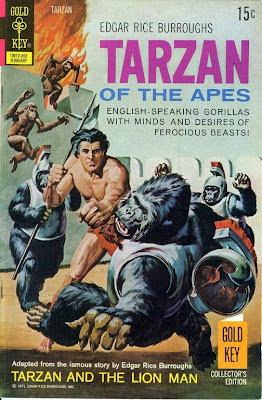 But sooner or later I'll pick up one of those books and can't help but smile at the wild fun we used to have with it. I doubt I'll ever run Rifts again (unless the revamp the mechanics), the rules system just doesn't work for me anymore. But man I've got some great memories! Slavers, the original racial name for their people was lost ages ago, are a race of large, extremely obese blue skinned humanoids. For centuries, Slavers have engaged in the slave trade of other sentient races. As they would say, "it's nothing personal, just business". They will work with whomever or whatever will pay their prices, whether it be Badoon, Deonists or worse. They have their greedy fat fingers into all sorts of shady business transactions across the galaxy, but the core of their money making endeavors is the slave trade. In fact many believe they got their start and much of their technological advances from direct dealings with the Deonists, the Slavers being a psionic race (and potential "prey" of the Deonists) opted to make a "deal with the devil" the Deonists, and rather than become victims to these Devils they instead capture and send other psionic races to their doom. Many clients have special requests, and are willing to pay big money to those that cam meet their requests. To enable them to meet these special requests, the Slavers have engaged in extensive genetic engineering experiments that have enabled them to create special "Hounds" from other races. These hounds are specially designed Trackers sent out after particular quarry, just one more reason for other races to loathe the Slavers. Slavers are also always on the lookout for means to better control their slaves, psi-tech devices and artifacts in particular always draw their interest. Spending years as "businessmen" has atrophied their physical abilities, indeed Slavers find it beneath them to engage in manual labor, after all, "that's what slaves are for! "…but they have more than made up for it in enhanced intellects and a wily cunning, in fact the majority of Slavers are quite skilled psychics, especially in telepathic pursuits. SWN Default Settings Note: Slavers have been slowly on the rise ever since The Scream, there is some speculation that Slavers are actually descended from genetically engineered humans specially created to have enhanced psychic abilities, The Scream destroyed this project leading to the evolution of this vile blight upon the galaxy. Stats: Str & Dex are 2d6, Int & Wis are 2d6+6, roll rest as normal. The Majority of Slavers have some Psychic ability and those in positions of power and prominence are almost always full-blown members of the Psychic Class, frequently of significant ability. All Slavers start play with a free bonus Psychic point. PC Note: Slavers are not recommended as a Player Character race. This write-up is very loosely based on the Slavers from Marvel Comics, first appearance Excalibur #17 1989. No copyright infringement is intended! *Due to the creatures four arms any Grappling or Climbing attempts are at +4 . These 8' tall alien apes are a true terror whenever they are encountered. Originally believed to have been from a distant jungle planet, their original homeworld has long been forgotten, now they are scattered across the galaxy apparently as a result of zoo exhibits, many escaped into the wild and now prey upon those that once viewed them as freakish beasts. To compound the problem a recent trend by unscrupulous criminals and such is to use these creatures as guardian beasts. Only the most vile and desperate would do this, for no one has really been able to successfully domesticate these creatures, and they seem particularly hostile to humans. There are many cantina tales of criminal hideouts being overrun by the very beasts used to guard their compound. Have a Great Simian Saturday! My buddy Giles emailed me the other day, asking my thoughts about the Stars Without Number RPG. He also said he missed my alien race posts for the game. Well after several exchanges with him about the coolness of SWN, I dusted off my notes and thought I'd post another Marvel Alien race. 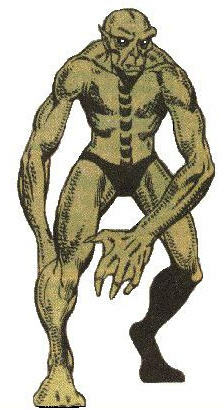 The Badoon are a 6' tall race of reptilian humanoids. Although the Badoon are an older race in the galactic scheme of things, they were quite late (compared to other races) in developing advanced technology. This was primarily due to an unusual gender schism…a hatred actually between the male and female members of their species, this conflict held them back from expanding and developing for centuries. The Badoon fought full blown gender wars for ages. After a time the males won and placed the females into captivity. In time, the males developed technology and abandoned their homeworld, leaving the females behind, returning only when their mating drive made it necessary. Their society is now divided into two with the Brotherhood of Badoon (ruled by a "Brother Royal") and the Sisterhood of Badoon (ruled by a queen) dwelling on the original Badoon homeworld, sometimes referred to as "Swampworld". The males became conquerors of other worlds and races, while the females became more pacifistic, apparently content to remain on their homeworld and oblivious of the males' star-spanning empire. 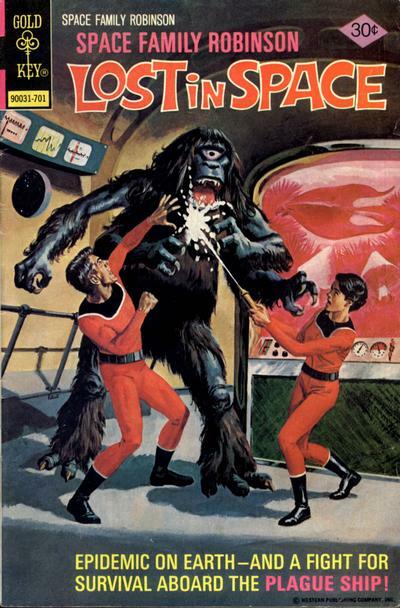 Some scientists of other races believe the Badoon males developed some plant-based chemical means to control the females, but so far have been unable to prove this theory. The Badoon will do whatever necessary to conquer other races; whether it is bolstering their forces with Zom soldiers (the corpses of victims turned into cyborg warriors) or putting a long term intricate plan in place that may take decades or longer to bear fruit. 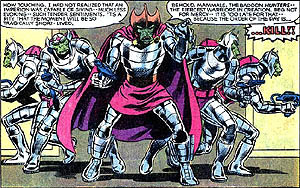 The Badoon are believed to be active on countless worlds, many worlds are unaware of the Badoon's plotting of their society's downfall. 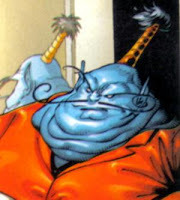 Currently the Badoon control (either overtly or covertly) multiple star systems and work to conquer and dominate more. Cloaking Field: The Badoon have taken the Artifact Tech of Ghost Mantle armor a step further and have been able to develop personal Cloaking Field technology. This field renders an individual Badoon effectively invisible! The Badoon and any gear that he is carrying are completely invisible. Only specially designed sensors can detect his presence. 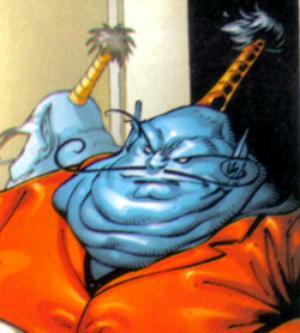 Should the Badoon drop an item he is carrying, the item will immediately become visible. Any footprints or tracks he makes will be visible; also the cloaking field does not affect any sounds the Badoon may make so if he is noisy he will draw attention to himself. All attacks against the Cloaked Badoon are at -4, unless the attacker is using specially designed sensor devices. Should the Badoon attack any creature/person the field is disrupted and the Badoon becomes visible. These personal cloaking fields are rare even among the badoon and only used by their elite warriors and special scout teams, they also go out of their way to make certain this technology does not fall into the hands of other races. They will never trade or sell this technology! A Badoon female…no wonder the males all moved to another planet! SWN Default Campaign Setting Notes: The Badoon were not affected by The Scream for two reasons, one they were slow to develop technology and so at the time of The Scream were not key players on the Galactic Scene; the Terran Mandate considered them to be a minor nuisance back in the day. In fact one could argue that the Badoon benefitted from it, with the Terran Mandate devastated by The Scream the Badoon have been able to expand their Empire and two, to date no Badoon has exhibited any psychic ability. So their technology never had a basis on Psychic energy. 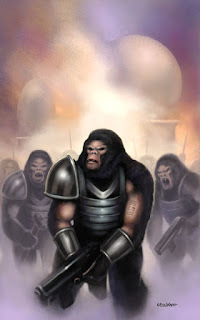 A player character Badoon is quite rare, they tend to stick together and work to dominate other races, in fact a lone Badoon working with other races is more likely a spy for his Brotherhood, so most other aliens tend to distrust a lone Badoon's motives, however a renegade Badoon while quite rare is possible. Badoon roll 3d6 for stats but must have a minimum of 14 in their strength attribute. Their scaly hide grants them a natural AC of 5 against primitive weapons. Their scaly skin tends to get irritated when other armor is worn over it, so they seldom wear much clothing or armor at all. Being Cold Blooded creatures they avoid cooler climates and in fact in temperatures below 40 degrees are at -2 to all attacks and skill checks, unless wearing an environment suit. PC's will not start out with a personal Cloaking field, unless the GM decides otherwise. 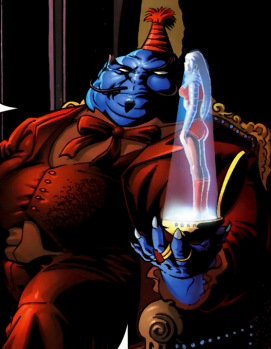 Also unless GM states otherwise, PC Badoon cannot be psychics. Adapted from Marvel Comics, I tweaked them slightly to fit in with the Stars Without Number Campaign Setting. 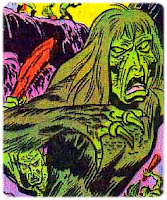 The Badoon first appeared in Marvel Comics Silver Surfer #2 (1968) No copyright infringement is intended. I recently found The Colossal Class List, which prompted me to go through my old copies of White Dwarf (before it went all Tabletop) and my old issues of Dragon Magazine (damn how I miss that coming to my mailbox!). Anyhow I got to thinking about how to use these alternate classes in my Campaign, so I worked up the below Encounter Table for those times when I need the party to encounter something, or should I say someone different. I figured this as more of an Urban Encounter table otherwise the bandit, huntsman and other encounter chances would be different. I didn't include Ninjas or Samurai but they are easy enough to add in there. I hope you get some use out of it. Enjoy! I haven't posted about Stars Without Number in quite awhile, but it is still one of my favorite Sci Fi RPG's out there today. It's just hard to get much gaming in these days and when I do get to play most folks around me are strictly into Fantasy gaming. Anyways thought I'd share something I found on the official Sine Nomine Publishing Site. 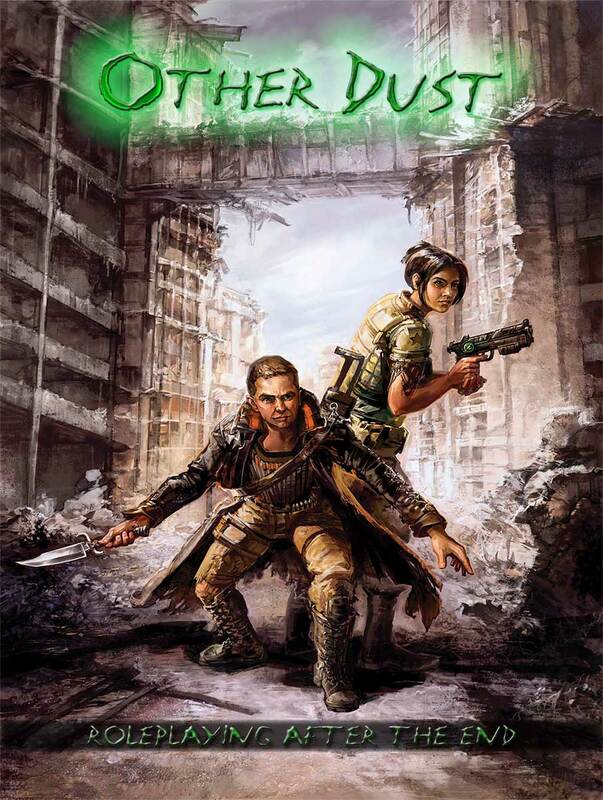 The cover to the SWN Post Apocalyptic expansion to the game, Other Dust! It's due out this summer, and some of the behind the scenes bits I've seen look awesome! The world is an open grave. Green glass plains and trinitite pearls necklace the throats of torn cities. Prismatic jungles heave with nanite-infested life, thick with twisted bodies and fever-hot madness. The ancient towers of Old Terra are cast down into the mire and the stars above no longer send their ships of steel and burning light. Humanity has been reduced to struggling enclaves and fugitive tribes. Left to scavenge the bones of their former glory, mankind yet fights the New Earth with steel, salvage, and a burning defiance. If the motherworld means to end her children, she’s going to need a bigger apocalypse." "Other Dust is a stand-alone, fully-compatible companion game to the free Stars Without Number sci-fi RPG. Within its pages, savage mutants, crazed psychic overlords, runaway war machines and the relentless decay of a shattered world all conspire to snuff the last few embers of humanity. Yet heroes remain among the scattered survivors, and their courage and will to defy the coming night might yet save their people from a waiting doom. Use the tools this book provides to rebuild societies, reforge their ancient bonds, and bring a new dawn to a thousand points of night!" And to help wet your whistle! Here is a teaser about the game for free over at DriveThruRPG!